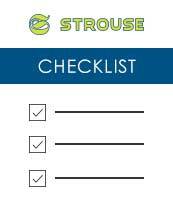 Industry Partners | Strouse - More than Tape. Strouse has a reputation for being one of the most accurate tight tolerance die cutters in the industry. Without the help and successes of our partners we would not be who we are today. Strouse leverages state-of-the-art machinery from Delta ModTech to enable tight tolerance converting. Delta truly understands the converting industry and what it takes to successfully launch a new product using adhesives. They've designed converting machinery that empowers converters to create the most sophisticated products and adhesive components in the market. Our partners and suppliers continue to push the limits on innovation in adhesives and flexible materials. Their groundbreaking technology allows us to provide custom converting services on materials that make the seemingly impossible projects possible. Fortune 500 companies rely on Strouse to solve difficult applications using adhesives. Our solutions help businesses save time and money, and bring new products to market faster. Partnerships with world class suppliers help bring these solutions to life. If you have a question about a project you are working on or think that using pressure sensitive adhesives can bring your product to market faster contact us today!